I don’t know the answer to that question, although I hope to find out. What I have recently discovered thanks to the help of a member of the Greaves family, is that Matron Ida Greaves RRC was mentioned in dispatches a third time. The third MID was documented in a supplement to the London Gazette 10 July 1919, p8788. Exactly why it was awarded I don’t know, although I suspect that it relates to her service during the evacuation of No 38 Casualty Clearing Station when the German army was advancing in March 1918. The following is an extract from Matron Greaves’ account of this incident: Next day [23 March 1918] we had patients everywhere & a very fierce bombardment was on. We evacuated patients by ambulance steadily. Colonel Lowe came to me & said the Military Situation seemed to be very serious & said would I tell the Sisters to be prepared to leave at a moment’s notice & to have their train coats etc ready & that we would not be able to take any baggage. He only had one ambulance at his disposal & the O.C. of the adjoining Camp promised to lend him another. There was a fierce bombardment & bombing all night & bombs dropping everywhere. At 5.30 a.m. Colonel Lowe gave an order that we were all to be ready to evacuate in 15 minutes time & could all take one piece of light baggage. 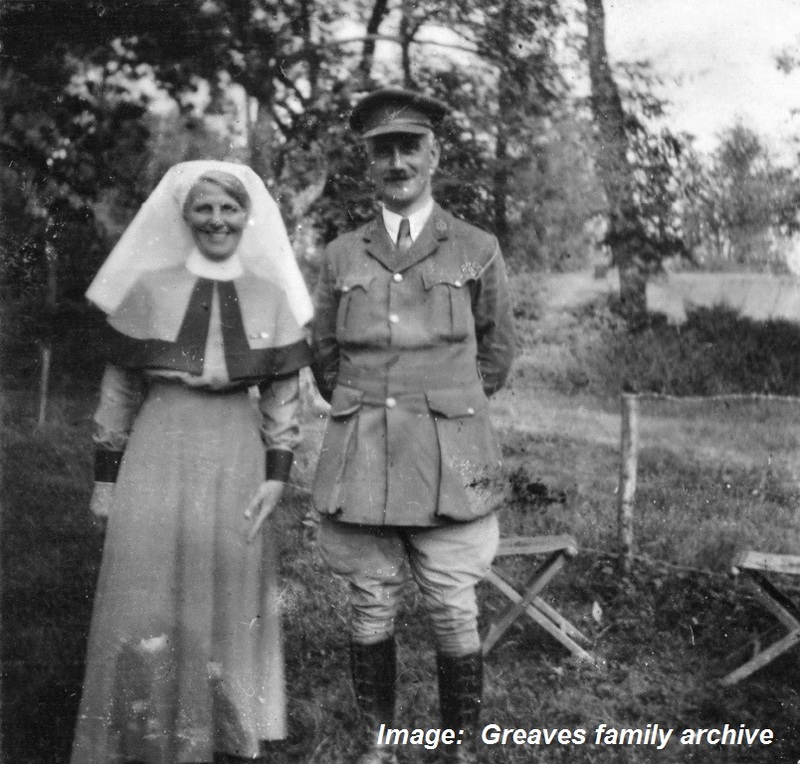 [Courtesy Greaves family archive] Casualty Clearing Stations were located close to the front line in order to provide speedy treatment of the wounded. Nursing and medical staff were non-combatant but were as vulnerable to artillery fire and bombing as anyone else whilst having the responsibility of caring for their patients as well as themselves. This entry was posted in Uncategorized on 06/04/2015 by Great War Nurses from Newcastle & the Hunter Region.